When a car is left unused, the battery can begin to lose charge because its not being topped up by the alternator. This is a common occurrence of classic cars that are used on sunny weekends as opposed to every day. To keep the battery topped up, you need the best battery maintainer, which is the Battery Tender® Plus 021-0128. It ensures the battery has optimum charge and automatically switches from full to floating charging modes to protect the battery. Maintaining your batteries charge levels increases its lifespan and ensures the car will fire up with ease when it is used, thus saving time having to jump start the car. You can have the best car battery in the world but if you leave it connected to a car that is not in use, it will eventually lose charge. Using a battery maintainer simply tops up the charge in the battery to ensure its at maximum capacity. Simply hooking up a powerful battery charger that runs at full charging speed all the time is not good for the battery of the car. Overcharging can cause a range of potential issues with one being boiling the sulfuric acid and distilled water mix, which is inside some standard batteries. Batteries are expensive to buy and having to replace them due to poor maintenance can be fairly frustrating. Below is a list of the best battery maintainers that will safely keep the battery topped up to its maximum capacity. 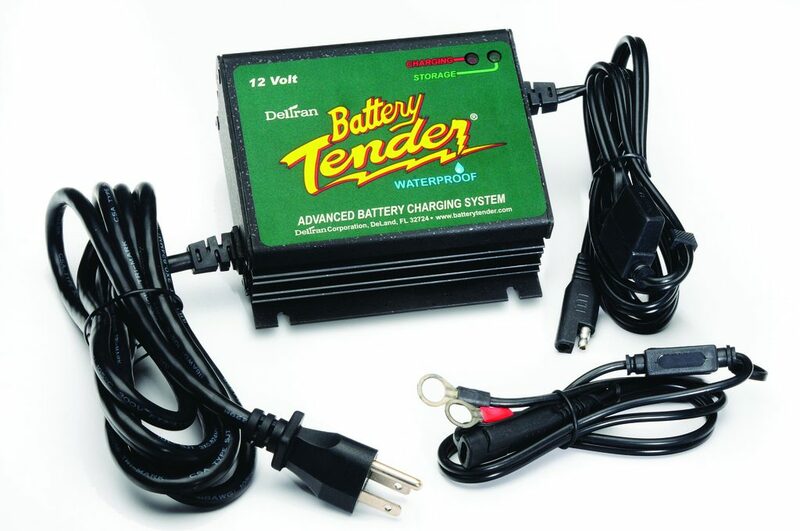 The Battery Tender® Plus is at the forefront of battery maintaining technology with a 1.25 amp battery charger. It has an astonishing 10 year warranty and has many features, which makes it the best battery maintainer for your car. One intuitive feature of this battery maintainer is the fact that it is temperature compensated. This means no matter the temperate, it will automatically adjust to ensure that the battery is charging to the correct voltage. Once the battery reaches its full charge, it will automatically switch to a float mode to keep the battery topped up. Overall, the Battery Tender® Plus 021-0128 is the best battery maintainer that will safely keep the battery topped up at a safe storage voltage. The brand also state that it will charge as fast or faster than any other 3 amp charger available. The cheaper alternative to the Battery Tender® is the Schumacher SC1300, which also has a 1.5 amp speed but only a 1 year warranty. It will also automatically switch between fully charged and floating mode when the battery reaches a certain limit. The Schumacher brand offer other models at an additional cost but there really isn’t any need to spend the extra. This 1.5 amp battery maintainer works efficiently and meets the highest industry standards as well as being DOE compliant. Overall, it is the best cheap car battery maintainer that is small enough to be kept discretely within any garage. One design feature that we really like is the hole at the top and bottom, which you can easily use a cable tie for mounting it. 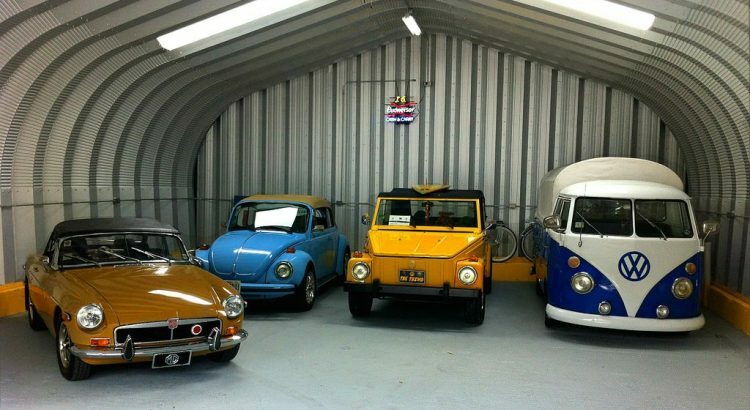 For those that are lucky enough to have a multi-car garage, maintaining all the batteries can be a difficult task. The last thing you want is multiple maintainers with wires going everywhere. However, this is where the NOCO Genius G4 comes in as it is a 4 bank smart battery charger and maintainer. The Noco Genuis G4 is a premium smart battery charger that is both the a normal battery charger and battery maintainer. It is by far one of the best smart chargers available that will charge all types of battery including 6 or 12 volt batteries. Obviously, all this technology and additional banks comes at a cost but it is truly a worthwhile investment that will not disappoint. For peace of mind, you do get a 5 year warranty when purchasing this device too. The BatteryMINDer is a reputable brand that produce a range of battery maintenance devices. The 1510 model in particular is an all-in-one device that acts as a charger, maintainer and an effective battery desulfator for complete battery maintenance. Included with the BatteryMINDer 1510 is a 12 feet power cord, insulated battery clips, ring terminal assembly and other hardware. It is the complete setup for maintaining a wide variety of batteries with the added bonus of the automatic high frequency pulse desulfator functionality. Black and Decker have been a reputable machinery brand for many years and are known for reliability and build quality. Their float charger is perfect for those on a budget and can charge at both 6V and 12V. The smart charging technology of the BM3B model ensure the battery remains at optimal charge. It will automatically switch between full charging and float mode, which is fairly impressive for a cheap unit. Optima are known for producing a range of vehicle batteries and now they have their very own charger and maintainer device. The Optima Digital 400 is a bit more sophisticated than the alternatives and suited to garages or enthusiasts. Optima claim that this battery is able to recover discharged batteries that other devices cannot. They state that if a battery is down to 1.25 volt, the Digital 400 12V Performance Maintainer will be able to recover it, which is very impressive. Like the Noco Genuis G4, it is both a car battery charger and battery maintainer. It is a great all rounder for those car owners looking for a device that offers unique features and more functionality. Car batteries can be very expensive and without proper maintenance, it can become a regular expense for cars that are in storage. From race cars to classic cars, no matter how good a battery is, it will eventually lose charge if the car is not used. A battery maintainer simply connects into a regular mains sockets and uses very little electricity in order to function. When powered up, you can then attach the the connectors to your battery terminals in order to maintain the battery. This short video of our top rated recommendation (Battery Tender® Plus 021-0128) in action. To provide more knowledge with regards to battery maintainers, we have devised an informative buyers guide to ensure you understand which is the best option that fits your requirements. When it comes to choosing a battery maintainer for your car, you will notice that you have amperage options. This is the amount of current it allows to flow from the device to the car battery with the higher rating resulting in a faster charge. In terms of generic battery charging, a higher amperage is more desirable but this is not the case with a battery maintainer. High amperage maintainers will have different modes that will allow you to choose the type of charging that you require. For example, some may require a “fast charge” and this can usually be selected from the interface of the maintainer. However, most people that are in the market for one of these devices will most probably leave it on a safe automatic mode. Some of the high end models will even provide diagnostic information regarding the health of the battery. It will not be as detailed as a car battery tester but it will certainly provide an indication towards the health of the battery. Remove the negative and then the positive cable from the battery terminals. Have the battery maintainer plugged into a socket but not switched on. Connect the positive cable from the maintainer to the positive terminal. Connect the negative cable from the maintainer to the negative terminal. Visually inspect the connection to ensure that it will not come loose. Select the charging mode that you require on the maintainer. Switch on the socket powering the maintainer. Monitor it and ensure everything is working before leaving it. Although there is quite a few steps, it is fairly straightforward to get it up and running. If you are leaving the car for a long period (i.e. over the winter), then regular checks are advised. You can usually just take a brief look at the maintainer and check for a green light, which means everything is working fine. As the term “trickle” may suggest, a trickle charger will apply a constant charge to the battery regardless of whether its fully charged or not. This is different to a battery maintainer as this will charge the battery until its charged. Once charged, it will switch to a “float mode” that only will charge the battery once it detects the voltage has dropped and simply keep it topped up. As you can imagine, a trickle battery charger that is connected indefinitely is not healthy for the battery. Once a car battery is fully charged, it should not have the same voltage sent to it constantly. Trickle chargers do have their uses but if you want to leave a charger in for long periods of time, a battery maintainer is what is required. The benefits of battery maintainers that use a float charge are fairly obvious. The main being convenience of having a fully charged battery in a car that has been stored for a long period. 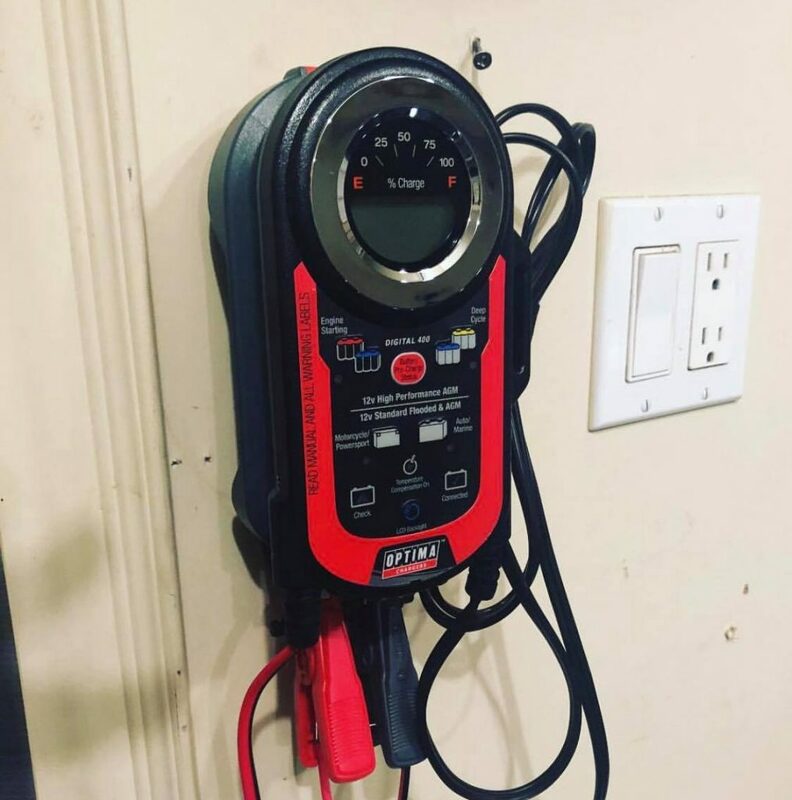 Although there are many portable jump starters that will jump start the car, it is much easier to keep the battery topped up with a maintainer. On top of this, battery maintainers ensure the battery is charged safely at the correct voltage. This means the battery will not become damaged from being overcharged or being drained multiple times. If you have just bought a new car battery, you want to ensure its kept healthy and a battery maintainer will do exactly that. Using a battery maintainer comes with various benefits as stated above and will ensure your battery is topped up and healthy. Many car battery chargers come with this functionality but using a battery maintainer that has one purpose, which is to maintain the battery is the best option. All of our recommendations above perform this functionality and are relatively cheap to purchase too. The Battery Tender® Plus is the best all rounder but for those that have a garage or simply want more functionality there are alternatives. The Noco Genuis G4 and Optima Digital 400 provide further features that can transform how you maintain your battery. My 2008 Subaru could definitely benefit from a battery tender. However, I only have on-street parking. Being a total novice on this topic, I ask if there are any non-plug in options for helping out my battery? It tends to go dead during the winter when I’ve been out-of-town for a week or two. Last winter, after being gone for 10 days, my battery didn’t even have enough power left to click open the doors. And my mechanics can’t find any obvious source of power leakage. Hey Karen – If the battery can only last 10 days and there is no evident battery drain, I would personally look for a new battery personally. I would also look for one that can handle colder weather too (AGM would be ideal). I haven’t seen any “on-street” parking style battery tenders but I will definitely keep my eyes out for you! Do you need to disconnect the battery from the car each time you use the battery tender. New cars have to reset all the electric operated devices if the battery is disconnected. Can you use it with the battery connected. Is a 1.25 amp the right size for conventual 12 volt batteries . My Mustang sits for a week at a time will 6 hour battery tender once a month eliminate the battery going dead.